Due to clouds in the sky, climate gets cooled down. Vapor in the clouds liquefy and become water drops. Those water drops are referred as rain. But the expanding clouds move up in the sky with a speed of 1-10 meters per second. When the clouds are moving up, along with them small water droplets also move up. While the clouds are moving up, these water droplets get accumulated with some more water drops and form big drops of water. These heavy water drops cannot go up due to the weight. They come down due to the gravitational force. Moreover tiny water drops get into the spherical shape. 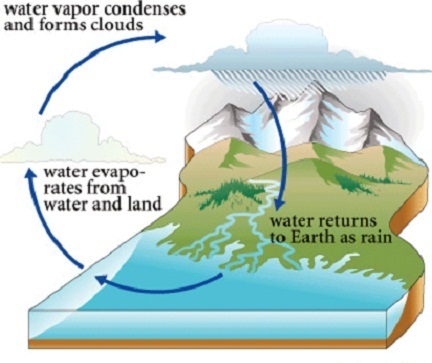 As the transformation of water vapor in the air into water drops is a slow process, rain falls in the form of droplets only. But in the case of formation of Cyclone or depression in the Ocean, much amount of water vapor gets liquefied into droplets. Hence rain falls as drops quickly one by one. It appears as if rain is falling as a flow of water. This rain is referred as heavy rainfall.